Oh boy... 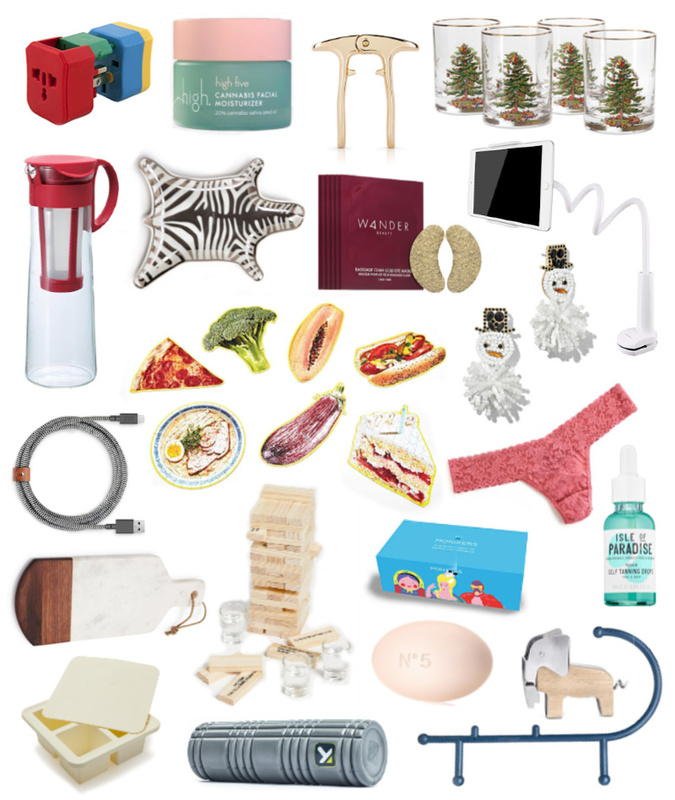 It's finally time to kick off my holiday gift guides! I know I've been quiet on the blog lately, and what the future holds for SUILTSOY, I'm not really sure. But I love doing gift guides, I love creating them, and I love helping people get through this stressful time of year with fun and playful gift ideas that are easy to find and dun, dun, dun—affordable! Every year this is probably my favorite gift guide to create—mostly because this is the wheelhouse I live in. I rarely if ever spend more than $50 on a holiday present for anyone other than my parents, so I pride myself on thinking of clever, useful and enjoyable presents that won't break the bank. Naturally, many of this year's selections will make great stocking stuffers (in the $10 to $30 range) and then there are a few things that skirt the barely-under-fifty mark, too. Since I rather painstakingly sussed out each of these by hand (because I love you guys! ), I'm going to walk you through each one and give a little explainer on why it'll make a great gift! Hario Mizudashi Cold Brew Maker, $17: I own this cold brew coffee maker and can't say enough good things about it. It's easy to use, the brew is strong and more than one person has remarked, "this is the best cold brew I've ever had." I'm not kidding! Flight 001 5-in-1 adapter, $35: Listen, I know this isn't the sexiest gift you've ever seen, but if you have a friend or family member who travels a ton (internationally), they will love this! Tryone Tablet Mount, $20: Listen, this is a very specific gift for a very specific person—if you don't know someone who uses their iPad in bed like a TV, just move on. If you do... Change their life with this flexible stand that can clip to the bed frame or a bedside table. Thera Cane, $31: The first time I saw this thing, I laughed. Then I used it. It's a funny gift—not quite a gag but definitely a little silly... But everyone will be passing it around and using it to massage their aches and pains on Christmas morning. Spode Set of 4 Christmas Tree Old Fashioned Glasses, $40: I've definitely featured Spode on my holiday gift guides before, and perhaps these very glasses. They just make me feel so nostalgic and happy (my family has tons of their sets) and I know I'm not alone in that! Monikers Party Game, $30: I am a sucker for a good party game and I've heard this one is really fun—I think I might pick it up for a little entertainment with friends and family while we're out in Sun Valley. Chill Out Stumbling Block Game, $25: This fun drinking game has little challenges on every block. Like Jenga, but for the over 21 set. GoldBelly Gift Certificate, $25 & up: I wish I had invented Goldbelly. This genius company sends specialty foods and treats from your favorite spots pretty much anywhere in the country. I'm talking a full spread from Ess-a-Bagel, pies from Daily Provisions and sweets from Milk Bar. An electronic gift certificate printed out and tied to a Mast chocolate bar makes a perfect last-minute gift. Sur La Table Cheese Board, $45: If you know someone who likes making cheese and charcuterie plates for dinner on the regular like me, this would be a nice gift. BaubleBar Snow Drop Earrings, $48: These earrings are silly and sweet and I just love them! But remember that statement earrings can stretch out your piercings, so I suggest adding these genius little stickers (that support your lobe) to the gift to really make her happy. Viski Gold Champagne Pull, $26: Listen, until I saw this year's Goop gift guides I didn't even know a champagne pull was a thing. But it's beautiful and unique, so I'm supportive. Wander Beauty Baggage Claim Eye Masks, $26: I tried these much-Instagram-ed eye patches recently and I gotta say—I loved them! Then again, I am a mask-a-holic at this point, so maybe only give these to a woman like me who believes they work and then—they do. Native Union 10 ft. Power Lightning Cable, $40: If you want to change someone's life this holiday season, gift them a 10-foot-long lightning cable to charge their iPhone. They will never be the same, they will sing your praises, you will be the hero of the day. Christmas Vacation Playing Cards, $9: These cards aren't pictured above, but I am extremely into playing cards these days and think everyone else should be, too. And who doesn't love this Christmas classic?! High Beauty Cannabis Facial Moisturizer, $40: CBD, so hot right now. CBD on your face? Truly helpful in calming skin, putting acne at bay and treating fine lines and wrinkles—not unlike retinol! Chanel No. 5 Bath Soap, $26: It's Chanel! It's soap! It's affordable! TriggerPoint Foam Roller, $28: Another not-that-cute life-changing gift? A foam roller. They cure what ails you from head to toe, and we should all have one. Hanky Panky Low Rise Thong, $22: It's a classic, okay? Kikkerland Elephant Corkscrew, $14: This is a corkscrew shaped like an elephant. That's adorable, okay?